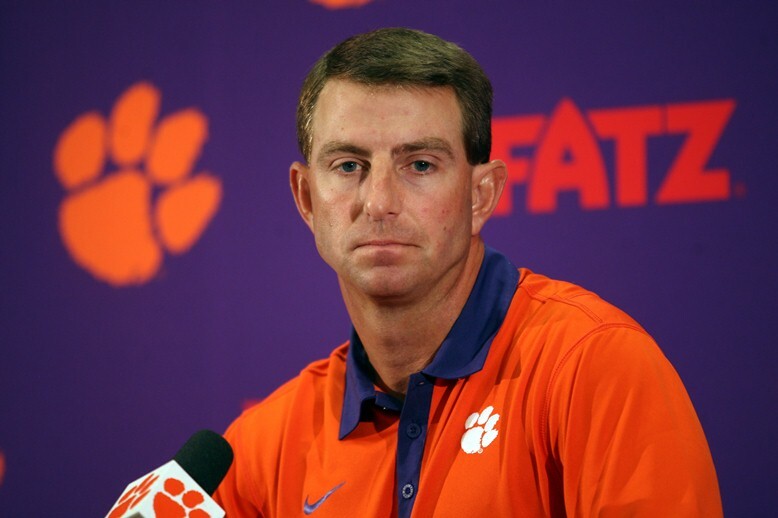 Dabo Swinney, head coach of the top-ranked Clemson Tigers, has been named the Walter Camp 2015 Coach of the Year. The Walter Camp Coach of the Year is selected by the nation’s 129 Football Bowl Subdivision head coaches and sports information directors. 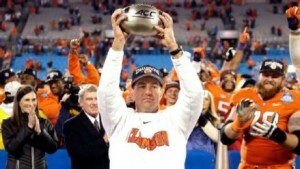 Swinney is the first Clemson coach to receive the honor. Under Swinney’s direction, Clemson recorded a perfect 13-0 record and the No. 1 national ranking in the College Football Playoff poll. With Swinney at the helm, the Tigers recorded wins against three Top 10 teams (Notre Dame, Florida State and North Carolina) in 2015, and posted nine straight games with at least 500 yards of total offense. The Tigers, behind quarterback and Walter Camp Player of the Year finalist Deshaun Watson (279 passing yards, 131 rushing), captured the Atlantic Coast Conference championship with a 45-37 victory over North Carolina on December 5. Clemson will face No. 4 Oklahoma in a College Football Playoff Semifinal in Miami, Fla. on Dec. 31 at 4 p.m.
A native of Pelham, AL, Swinney attended the University of Alabama where he was a walk-on wide receiver who went on to earn a scholarship. He played on the Crimson Tide’s 1992 National Championship squad. He served as an assistant coach at Alabama from 1993 to 2000 and was hired at Clemson in 2003 as recruiting coordinator and wide receivers coach. He was named interim head coach in 2008, and led the Tigers to a 4-2 record and a Gator Bowl berth. He was then named permanent head coach on December 1, 2008. In that time, Swinney has recorded an impressive 74-26 career coaching record (.740), including double-digit victories in each of the last four seasons. Coach Swinney, along with members of the 2015 Walter Camp All-America team, will be honored at the organization’s national awards banquet, presented by First Niagara Bank, on Saturday, January 16, 2016 at the Yale University Commons in New Haven. In addition, the Foundation will recognize three individuals – Special Olympics CEO Tim Shriver (Distinguished American), former Florida State and Oakland Raider standout wide receiver Fred Biletnikoff (Man of the Year) and former Grambling State All-American and NFL quarterback Doug Williams (Alumnus of the Year) – with major awards.